It can be found in rivers and diches but leaves its freshwater home to breed. Eels have one of the most impressive migration journeys observed in nature as they migrate to the Sargasso Sea, an area in the Atlantic Ocean. Young eels (known as ‘Elvers’) return to fresh water to develop. Eels are scavengers and predators feeding on fish eggs, dead animals, invertebrates and other fish. Eels are snake like freshwater fish and are similar to lampreys. They are distinguished by their distinct pectoral fins and jawed mouth as opposed to the sucker mouth found in lampreys. Eels range in colour from silver to olive green and have yellow bellies. The Riverlife Almond and Avon project aims to remove barriers and restore habitat on the river Almond and the river Avon. This will aid fish migration and reproduction. The European eel will benefit by being able to access quality upstream habitat to complete the adult stage of their life cycle. The Riverlife project runs a volunteer electrofishing training program. This involves volunteers in the monitoring of freshwater species present at sites along the Almond and Avon rivers. This provides the opportunity to encounter the elusive eel. If you’re interested get, in touch. 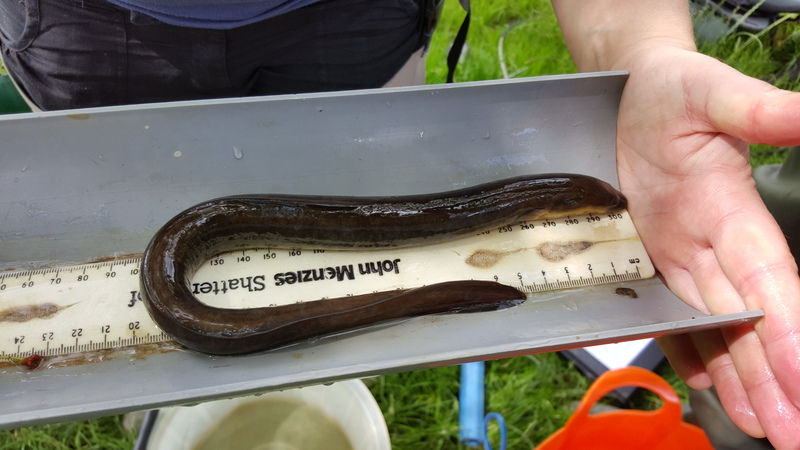 Have you spotted an eel in your local river? We want to hear from you! If you have, then send your photos or stories to us at riverlife@forthriverstrust.org.